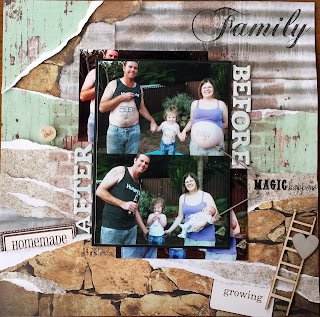 The other day I told the story of taking some family belly photos here and today I share the scrap page I made using the best set. I struggled with this page for quiet a while! The photo is special to me and I wanted to do it justice. I had a few options in relation to the theme and color scheme. I could have gone down the love path with lots of hearts or taken the baby road with rattles, bottles and teddy bears. I could have pulled colors from our clothing or made the pic black and white. Instead I chose to embrace our back yard and use the fence, rock wall and greenery to guide me. Kaisercrafts base coat collection was absolutely perfect for this and ultimately made my decision for me! I decided to give my scissors a rest from this layout and ripped all the papers, showing the white inside to give it a bit of a rougher layered look. I love the word stick pin from little yellow bicycle, it was hard to decide which one to use, I nearly put them all on. I print all of my pictures for scrapping using my borrowed-from-mum-with-no-intent-to-return hp photo printer. It is really old and very moody! It refuses to print decent 6x4 photos, always messing up the colour, so I use word, print them on an A4 sheet and cut them out. But sometimes even the A4 sheets will come out with funky colours. 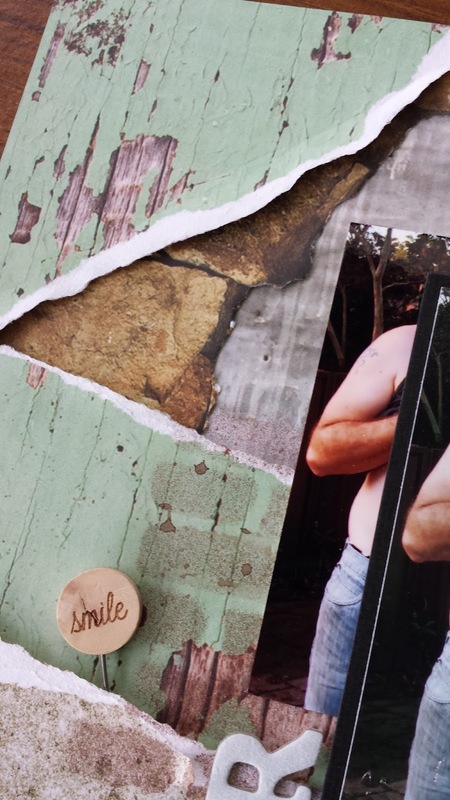 This happened with these photos numerous times and I couldn't just throw them out so chopped 'em up and threw them on too at an offset creating the perfect gap for the alphas and date. I brought the ladder because I thought it went with the backyard-ish theme, but by putting the cut out square 'growing' under it made it more of symbolism of our family getting bigger. 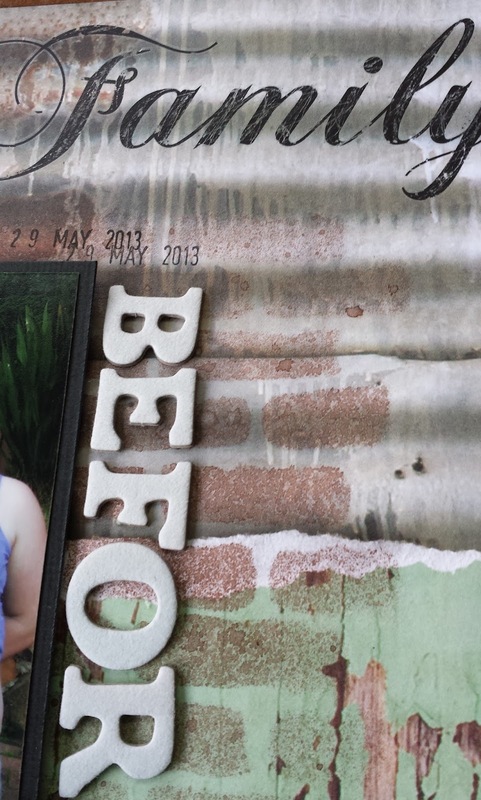 I left all the wood/chipboard bits raw to keep with the natural look of the papers. 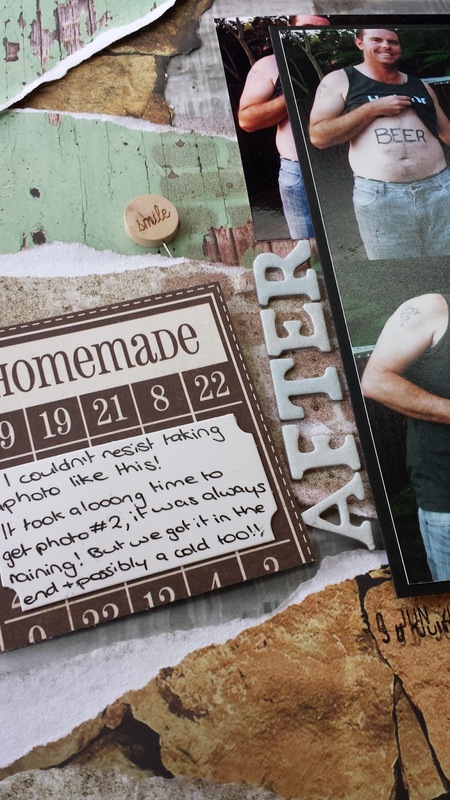 I wanted to subtly point out that what was written on our belly in the first photo is what we are holding in the second, what better way then to use arrows! 'Magic happens' seemed like a perfect fit cause having a baby is pretty special, amazing and magically. I wanted to put the word 'family' on my page somewhere and had lots of options in my stash, embellishments, alpha stickers, papers, rub ons etc I decided to keep with Kaisercraft and use there rub on words. However I didn't want it to take away from the photo, so after rubbing it on I got my scissors out of retirement and scratched at the word. Giving it a rougher look and breaking up the solid black making it look lighter. The brick stencil has been in my stash for ages and what a fitting layout to use it again. I used glimmer mist with it over all of the ripped papers to help unify the layers. 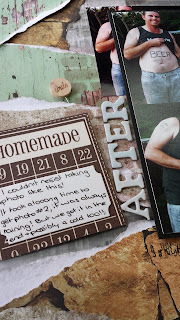 The 'Homemade' bingo card lifts up to reveal my journalling: "I couldn't resist taking photos like this! It took a looong time to get photo #2, it was always raining! But we got it in the end + possibly a cold too!!" It really was freezing! AC - Thickers - ?? 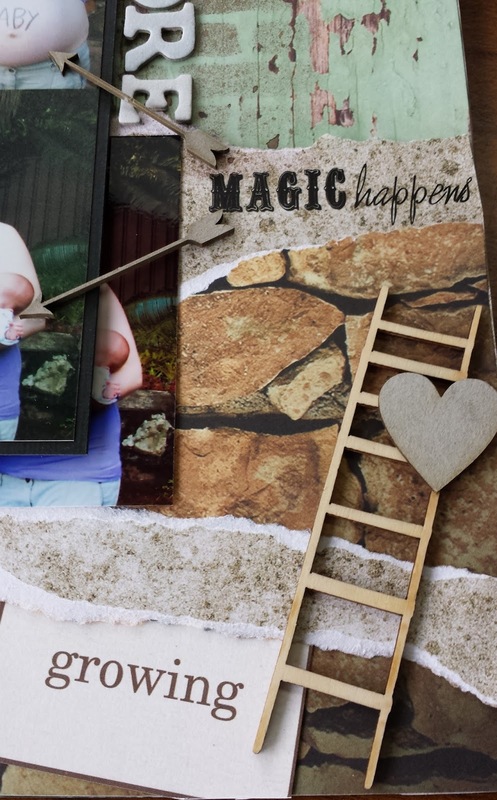 This is gorgeous, I love the before and after photos, and the ladder with the heart on!